Week 5 is over and we're halfway through the league matches! Biggie Bandits is one match ahead in the Blue Division, and we still have a 4-way tie in Red Division between Team J&J, Darmok & Jalad, The Collective and G-Force Express. Good luck to all teams this week! In week 4, Team J&J and G-Force Express are on top in Red Division, and Blue Division has opened up with The Afterdroppers, Biggie Bandits and so nice all tied jointly for first. 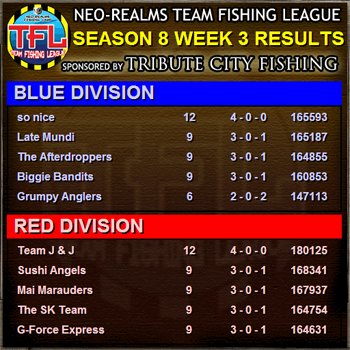 After Week 3, Team J&J lead the Red Division, and so Nice also remain undefeated in the Blue Division. Good luck to teams this week! 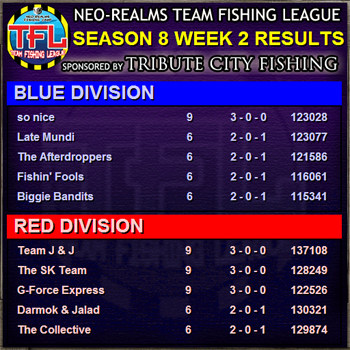 Week 2 is done and so nice remains the only undefeated team in Blue Division, while Red Division has 3 undefeated teams: Team J & J, The SK Team, and G-Force Express tied for first! Season 8 Week 1 Results! 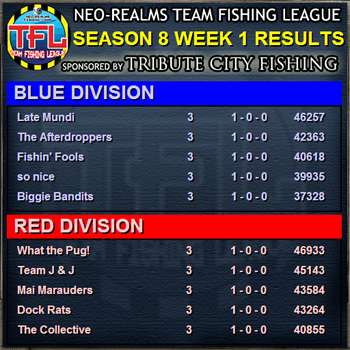 Season 8 is underway and we have the first week's results in! Good luck to all teams next week!